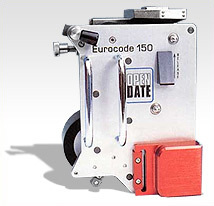 The Eurocode is a small, lightweight, user friendly Hot Foil Coding attachment. The unit can be used for overprinting text (batch & lot code information, expiry and use by dates, price marking, etc.) as well as simple graphics in any colour, on to flexible packaging materials at speeds of up to 700 cycles per minute. 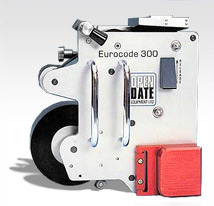 The Eurocode 300 has twice the foil roll capacity of the Eurocode 150. In simple terms this means that it will operate for twice as long before the roll runs out and has to be replaced hence less down time and longer production runs. Eurocodes feature an easy change foil magazine with automatic foil drive location system enabling downtime for foil replacement to be kept to a minimum. They have the fastest warm up times and to further reduce downtime, an optional spare magazine can be ready loaded with foil for immediate changeover. All Eurocodes are supplied with an electronic control unit, any standard Type Holder and a high speed solenoid valve assembly. They can be easily adapted to suit rotary coding boxes or type characters.